d-PIT Solutions offer a comprehensive service when it comes to maintaining your hardware - from Servers to Desktops to Mobile Devices (tablets & phones). Computer malfunctions can be terribly frustrating. 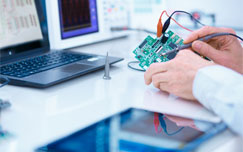 When your hardware does break, d-PIT Solutions provide comprehensive computer and IT repair services that is designed to remedy any of your organization's technology defects. Whether it's hardware or software, servers or workstation, we'll fix it or find you a new one. As an Ubiquity Networks partner, d-PIT Solutions have the skills and knowledge to deploy your wireless networking solution in your premises. d-PIT Solutions have partnered with Lenovo to make the best of breed hardware available to your business. At d-PIT Solutions, we understand how important a properly planned and executed computing infrastructure is to your business. Our knowledgeable and trustworthy IT technicians are well known for providing thorough wiring and cabling expertise that will meet your company's infrastructure needs. Our technicians are versed in industry best practices in regards to network mapping, setup, and management.